Has it been a while since you have been to the dentist? Do you have fear or anxiety about going to the dentist? If you do, you are among 5% to 8% of Americans who also fear going to the dentist. Whether your fear of the dentist is triggered from past experiences, or because you have never been, an experienced dental staff can make sure that you have no reason to fear your dental visit. At Legacy Dental it is our mission to make sure our patients leave with a quality dental experience. 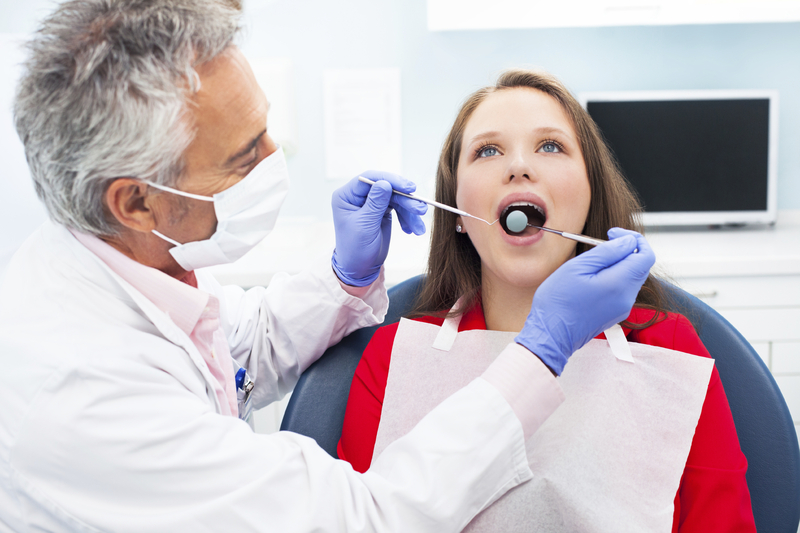 For those who are curious about what to expect at a routine dentist appointment, read on! Friendly Office Staff: At Legacy Dental, we have a kind and friendly office staff, ready to meet your dental health needs. We care about your comfort and care. When you come in for your dental appointment, check in with the front desk to let them know you are here. If you have any questions or concerns, feel free to let our staff know, and we would be glad to answer your questions. It is our goal to make sure you will have a positive experience at our Legacy Dental clinic. No Judgement: If you have never been to the dentist before, or have dental hygiene that is less than perfect, there is no need to be embarrassed. Legacy Dental has a compassionate and kind staff who is not there to judge your teeth. Our office staff is committed to improving your oral health and hygiene, and to help you on your way to a smile you can be proud of. Health History: As you may be aware, your mouth is an interconnected part of your whole body. To provide quality and conscientious dental care for your unique needs, Legacy Dental will ask you to fill out a complete health history. A knowledge of a previous health history will guide the dentist and dental hygienists to make sure you are receiving the proper oral health treatments. Privacy: At Legacy Dental, or any dental practice, your health history is kept absolutely private according to HIPPA laws. Rest assure your patient information is kept completely safe and secure. To learn more about how Legacy Dental protects your personal health history and information, feel free to ask our office staff. Reclining Chair: There is nothing better when going to the dentist, than to kick up your feet and sit in the reclining dental chair. Above each chair is easy viewing of your favorite daytime show, news channel, or cartoons for the kids. The reclining chair makes it easier for the dentist or dental hygienists to clean your teeth, take x-rays and perform delicate procedures in your mouth at your comfort. Dental Hygienists and Assistants: Prior to meeting with the dentist the dental hygienist will go over your health history, ask if you have any questions or concerns, take X-rays and intra-oral pictures and then complete a thorough cleaning and polishing of your teeth. Our hygienists have the experience needed to assist the dentist in providing the quality care you deserve. X-Rays: With modern technology and equipment, Legacy Dental keeps our patients safe from careless exposure to radiation, by only taking X-Rays when needed. X-rays are necessary to discover cavities, gum disease, abscesses or other abnormalities unseen to the eye. When taking X-rays, a dental hygienist will carefully place a small piece of plastic in between your tongue and teeth which you will bite down on. The X-Ray will only take seconds. A simple trick for the patient during an X-Ray is to relax and make sure your tongue is lifted to the roof of your mouth and out of the way. Dental Exam by Dr. Thuernagle: Our dental hygienists will assist Dr. Thuernagle in doing a complete comprehensive exam. He will review your x-rays and check your teeth and gum tissue. If you do have areas or teeth that need follow up treatment, Dr. Thuernagle with explain what needs to be done and why. If you have any questions or concerns don’t hesitate to ask. Dr. Thuernagle loves to help his patients understand how important proper oral health care affects not only our teeth but your entire body. Repair & Preventative Work: If by chance the dentist or dental hygienist find problem areas in your mouth, they will work to repair and prevent the issues from becoming a greater problem in the future. Sealants are a common preventative procedure, performed when your teeth have deep grooves. Grooves in your teeth make it easier for food or plaque to become trapped inside and begin to eat away at your tooth. A sealant helps to fill in that deep groove and prevent a cavity from forming inside. If the dental hygienist or dentist finds a cavity, or small hole in your tooth, then a filling may be needed. A filling is a necessary repair procedure to clean out the cavity and ‘fill’ the area to prevent the hole from deepening. The good news is neither fillings or sealants are painful and help to prevent more costly issues in the future. If small issues are not resolved, they can become more serious and more costly. That is why regular dental appointments can prevent small issues from becoming larger issues. Fluoride Varnish: Last but not least, the dental hygienist will paint a thin layer of fluoride varnish on your tooth. Fluoride helps to prevent cavities in the future. Ask the dentist how you may incorporate fluoride in your daily brushing routine to help prevent cavities. Schedule a dental appointment at least every six months. Maintain your dental health through regular brushing and flossing. Contact a dentist if you feel any pain or discomfort prior to your normal checkup. Note: The article above is meant to give patients a general idea for a typical dental appointment, but does not include all information. For more specific details or questions about a routine dental appointment, feel free to call Legacy Dental at 208-346-8519.